Will try to keep this short and sweet. The game room, while not the hottest room in the house, is still getting more humid as the summer warms up. I don't have central air, just celing fans and a few window units in key rooms. We have a dehumidifier that we bought for the basement, but don't need it running in the basement at all times. I am planning to put it in the game room to protect all the posters hanging up and the pinball machine. My questions is about the humidty level. The dehumidifier doesn't have a humitidy indicator, but I can pick a level between min/max dryness. I am guessing that I don't want the room super dry. What would be a good level to set it at? I would get something to measure the humidity, to see what it runs, before I bought any more equipment. I would try to keep it from 25% to 55%. Anything above 55%, I don't like; but I have always lived in low humidity areas. When no one is in the room, them humidity probably doesn't need to be controlled more than 15% to 75%. But when people get in there, their respiration is filled with water, so the humidity in a small space is going to climb, if it's a closed space. So that's why I'd shoot for something like 40% max before people get in there and start playing. The only issue with low humidity is if you are going to work on the boards. Anything less that 35% you should take more electrostatic precautions. Not good, watch for playfield warping and rust. Its not that humid in the game room. Not even close. I just want to keep the room at the optimum level of humidity. I don't want it too dry, or too humid. You can get a thermometer that also reads humidity at Radio Shack for cheap. 75% sounds high, but I too have only lived in low humidity areas. Wait. You live in Az, which is drier than toast. Did you live elsewhere where you had problems? Any pics? I have lived in high humidity areas before, although I prefer low humidity. I would like to keep it as dry as possiable but don't want too dry. I can always try 50% and see how comfortable it is. Its been comfortable down there until now but I can feel it getting a bit more humid. My house is a confortable 76 degrees all year round, low humidity. I lived in boston for 20+ years. Seen a lot of games that are warped and rusted out back there. Lot's of local routes near the beaches in new hampshire and maine. Northeast is bad if you have collections in unfinished basements. Damp enviroment. Bought a hs2 out here in az for 1.1K. Apron, legs, and some hardware had light rust. Found out it came from the Jersey. Shopped it, played it for a couple months, sold it. Moisture and pinball is a bad mix. I have wondered about this A LOT. I live in Georgia (read HUMID!) and I know people that keep games in their garages year round and have for years. They seem just fine. And that kind of suprises me. I keep TVs and surround sound in my garage (for about three years now) and they work just fine too. Optimum level is probably 40 - 50%. Higher levels are OK, when you aren't in the room as long as it's non-condensing. The issue with higher humidity and damage to machines is that with large temperature swings, you can get condensing (liquid water) on the surfaces. I'd recommend to set the dehumidifier to 50% or less at all times. My wife is an Industrial Hygienist. She says 30-60% is what most people think is comfortable. Cigar humidor's should be between 60-70% and I find it uncomfortable when I walk in them. Too much humidity (above 80%) will also allow mold to grow. 50% will probably be just about right. Remember too that it is relative to the temperature in the room. I am resurrecting this topic because i would like to move my 250 gallon aquarium into my gameroom for a couple of reasons. i found this on a pdf for a tool shop and thought it was relative. surfaces warm or install a dehumidifier to remove the humidity from the air." i have two humidity meters coming on monday and will monitor the room for a week or so before putting the tank in there, then i will run the tank for a couple weeks before making it a permanent fixture in the room. There is also a cold air return within 3 feet of where the fish tank will be located so that should help to remove some of the humidity also. does anyone have any thoughts or advice on having a large fish tank in with pinballs? I would not personally do it. That is alot of open water and I like to try and keep the humidity as low as possible in general. I think it will be find with a properly condition house but still not a fan of the idea. yeah, that is a thought that keeps running through my head too. i like my fish tanks, but i love my pinball machines.... guess it is time to start house shopping instead. Someone commented in another thread that the threat to pins was more about changes in humidity over time as opposed to level. I live in the NE, so climate changes by the month. This winter, I measured the humidity level in my basement, where the pins are, and it registered at 35%. So, that is where I have been setting my dehumidifier for the spring and summer, trying to keep the levels as constant as possible. Sorry to resurrect an old thread but I'm having some issues in my basement. I was cleaning the other day and I noticed some discolored spots on my paint around 18" off the ground behind my couch. I checked around the room and it only seems to be happening behind things against one exterior wall. I just refinished the basement this past winter and it's the first I've seen this. Normally the humidty in my basement is pretty lowat less than 50% @ about 66 degrees. I use the room as an exercise area too. When I'm finished my workout the room is up to about 61-63% humidity. I'm guessing the rapid change in temps is causing the cold air condensing. I took a microfiber towel and rubbed the area and the stain went away so it appeared to be just on the surface. Does any one have any suggestions? Maybe run a dehumidifier while I exercise ? I tried running an oscillating fan today just to circulate the air, but humidity still got pretty high. I was thinking about some silica packets in the machines, but I don't want to remove all the moisture in the cab. Thoughts? 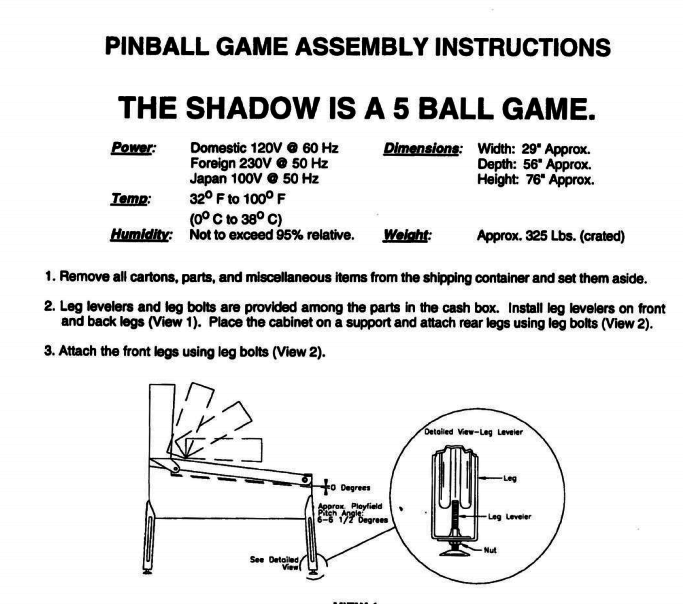 Can a pinball machine be stored in a quite humid underground basement? Measured relative humidity over the year is around 75%. The manual is saying the machine should survive 95% relative humidity. What is your experience on this? Just purchased a dehumidifier and think 50% may be a bit high. I try to keep my Game room around 45%. I haven't had any trouble yet. I have a dehumidifier in my basement with a humidity reader and only turn it on in the summer months when humidity is higher. I try to keep it at below 70% but it’s a battle. I also have a fan I put at a distance away to circulate but my machines over the years have been fine. I’m sure they can withstand at least 75% or more but try to keep it lower if you can. Amazing how much water this thing collects. I set mine at 50% and attached a hose to it, draining into my sump pit. I run it all summer. Exact same setup here. It's a necessity in my walk-out basement which doesn't seem to be very well sealed.